Hello everybody. Here's my addition to the implementation guide. A Thinkpad P51 combined with a Sonnet Breakaway box (350W) and an MSI GTX1080 Gaming X is a nice setup if you do 3d modelling / VR (Oculus Rift). I'm an architect. I mainly do 3d modelling in SketchUp, Unreal Engine and evaluate/present design options in VR (Oculus Rift). I used to work on a 5 year old desktop system (i5 3570) combined with a MSI gtx1080 gaming X gfx card. I wanted my setup to be more portable to be able show the VR at my clients' location as well. I tried a gamer laptop (MSI GS63VR 7RG) for a day but that one got very hot all the time (85 to 95 degrees and thus very loud). Instead I chose a Thinkpad (already using that line for 10 years) combined with an eGPU setup. Using this setup in windows 10 is very easy. 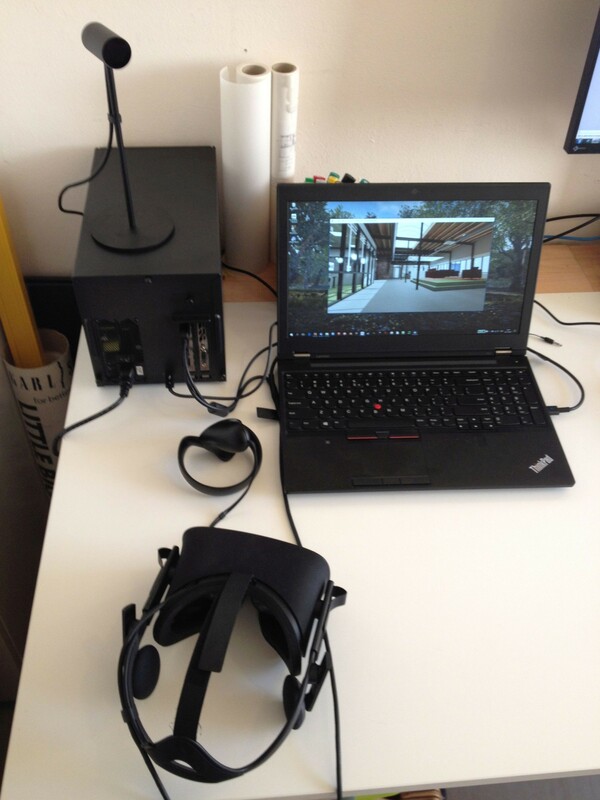 Start laptop -> connect TB3 cable -> first time; install TB drivers -> disable Quadro in device manager -> start Unreal / Oculus -> enjoy. I like that the laptop stays relatively cool (gpu disabled = less heat). On normal load (using Rift to view projects and using the internal laptop screen) you barely hear the fans spin. When playing VR games or during benchmarks they are more loud but not annoying. Maybe placing the eGpu under the table (longer TB3 cable) could improve that a bit. Suggestions to improve performance are always welcome. 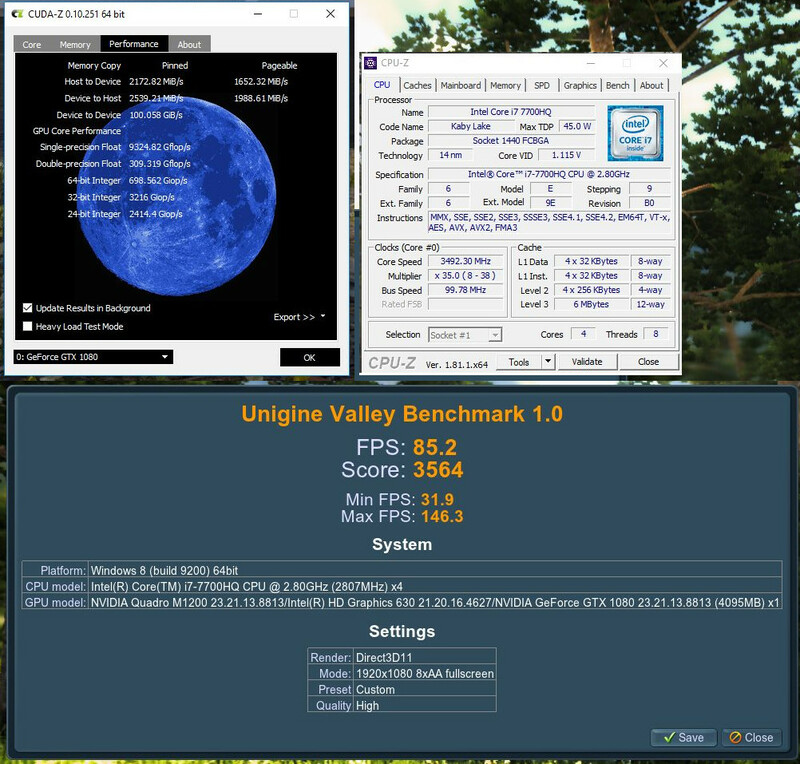 Feel free to ask questions for additional benchmarks. Edit 171111 - Performance gets slightly better (1% - could also be something else) if I apply this tip I read on this forum; open DeviceManager -> View -> DevicesByConnection -> disable the PCIe controller just above the dGpu (Quadro). Edit 171116 - Replaced the original 0,5m TB3 cable with a 2m cable from Caldigit (TB3 cable-active, 5Amp, 40Gb/s Usb-c) so the Sonnet is now under the desk (more space, less noise when on high load). Not a big drop in performance (Cudaz still around 2070-2130). Business grade Thinkpad goodness shines with your eGPU implementation. Care to submit more pics of your notebook + eGPU to bring it all to life? I have the same Laptop and would like to beef it up to play DCS World Flight Simulator. How is the performance going now and are you happy with the setup? Why did you choose the Sonnet and not look at something like the Akito? I was wondering if you can get sketch up to work with an eGPU. In my case I bought a akitio node eGPU with a Geforce gtx 1070 and tried to link it to my internal screen. But sketch up only seems to recognize my internal graphics card instead of my external and there is not an options to change this. How did you get it to work? I want to use it for real time rendering with enscape since I am an architect as well. Sorry for the late reply. Performance is still good! Very happy with the setup. I did look at all the alternatives but I choose the Sonnet because its price was a bit lower. 1. connect your laptop to the egpu. Browse to and select the application executable you wish to create a profile for. Choose the preferred graphics processor to use from the drop menu. After this, in the SketchUp preferences - OpenGl, choose the higher settings for anti aliasing and enable fast feedback.